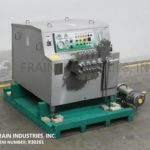 Frain Industries can help you with your 2 stage homogenizer project no matter how big or small your homogenizing needs. 2 Stage homogenizer equipment and machines have more intense mixing and dispersion capability and are used to form better emulsion or to develop flavors. Top manufacturers are APV and Gaulin. APV, Model LAB 1000, two stage, homogenizer. 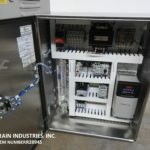 Rated output capacity of 6 gallons per hour – depending on materials, application and machine configuration. Maximum operating pressure up to 12,000 psi. 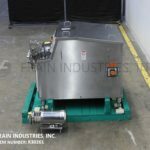 Equipped with poppet cylinders and CD valve seat, manual homogenizing valve actuator assembly with a 5" diameter x 9" deep hopper infeed, ¼" ID discharge and digital pressure gage. 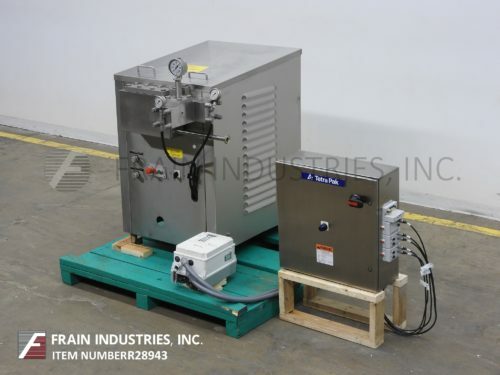 APV Crepaco Multi-Flo, Model 5DL425, two stage, stainless steel, homogenizer rated at 2,500 gallons per hour – depending on material, application and machine configuration. Maximum operating pressure:1,800 psi. Two stage unit equipped with (5) stellite seat ball valves. 2-1/2"OD / 1-3/4"ID Seated bevel sanitary charge port and discharge port.